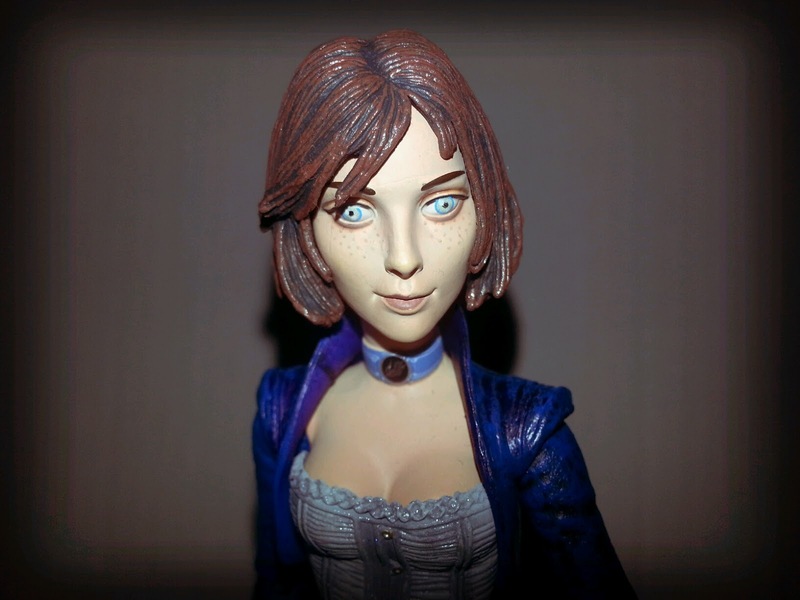 Even if you haven't played the video game Bioshock Infinite, just thinking about it most likely brings to mind the beautiful character Elizabeth. I guarantee that at the end of the year, she'll still be the most iconic character to come out of any video game. Generbeener went into great detail on one of our podcasts about the painstaking depths that Irrational Games went to to ensure that Elizabeth was neither just another pretty face nor an annoyance to the player, but a fully developed character in the story and an important partner to the player. While I have yet to play Bioshock Infinite (I'm fighting myself to finish this review rather than run off to the store to pick it up), I knew immediately that I was going to pick up Elizabeth. While I certainly am more likely to buy action figures from properties that I know and love, I'm also willing to pick up a figure just because it's a well done action figure. 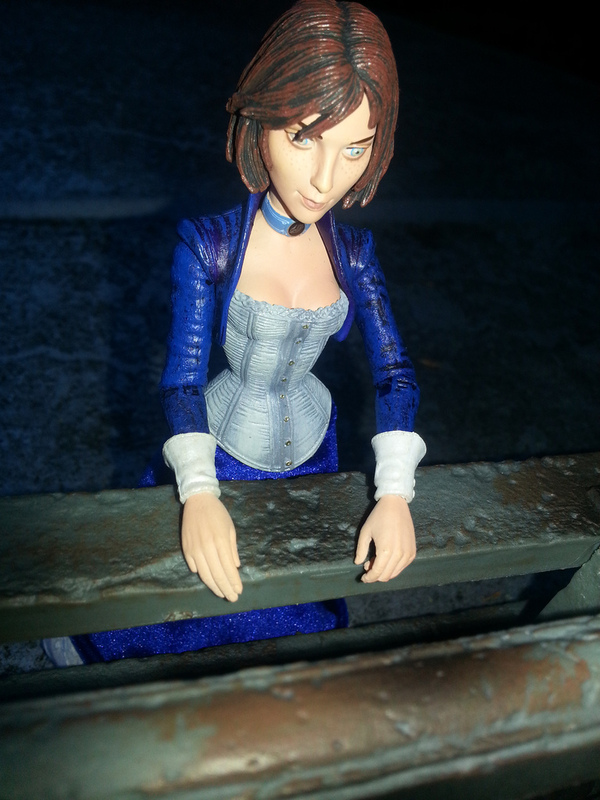 So while I have little to no knowledge about Elizabeth's role in Bioshock Infinite, here's my look at the amazing figure NECA has released. Enjoy! Elizabeth is right around 6 and 1/4 inches tall, so my guess is that she's in a 7 inch scale and just a little on the short side. While NECA's movie lines (they call them "Reel Toys") are typically done in a very realistic style, NECA video game action figures typically reflect the style of the source material. While Elizabeth could probably stand alongside most of your movie figures and not look too out of place, there is just a bit of stylization to her that reflects her video game appearance. Notice that the eyes that are just a little larger than normal and you'll get what I'm saying. She doesn't come with any accessories, but does have an actual cloth dress, something rather unusual in this scale. The dress flows very naturally and looks great in this scale. Typically, action figures of women in dresses are not highly articulated. That's not the case here and I don't think most folks are going to have a problem with Elizabeth's articulation. She has: swivel ankles, ball jointed knees, ball jointed thighs, ball jointed abdomen, ball jointed shoulders, ball jointed elbows, swivel wrists, and a ball jointed head. While the elbow joints might be a bit stuck at first because of the paint, all of the other joints work beautifully. I only had one problem and it's not really a QC issue, but more carelessness on my part: I thought that Elizabeth was articulated at the cuffs of her dress sleeves and not at her actual wrist, so when turning there that part of the figure popped right off. It's actually a separate piece that was just glued on and was easily glued back. The cloth dress and the soft rubber corset hinder articulation little, which is always a plus. Look at the picture and you can see the freckles, details on her necklace, and some details of the corset. 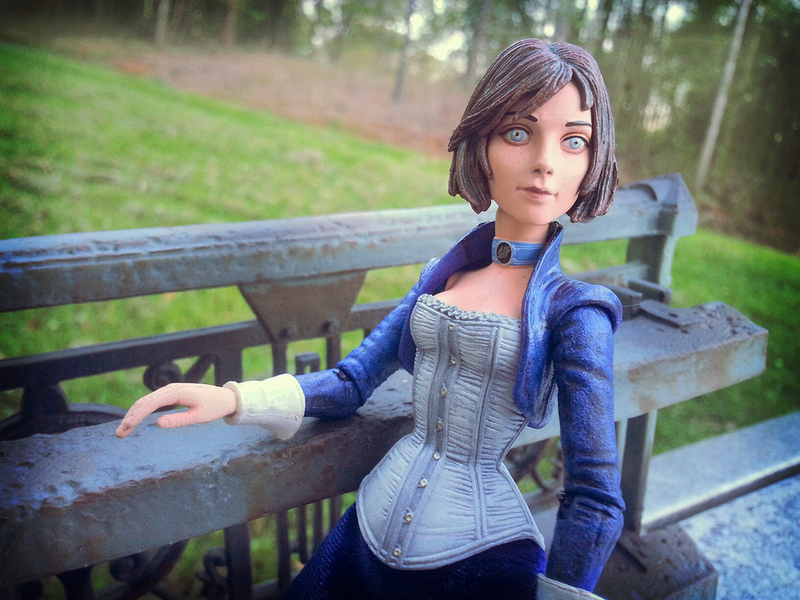 Elizabeth's sculpt is excellent. It is a fantastic representation of the character from the game and captures her simple yet captivating beauty. I love the face sculpt, as it seems to capture Elizabeth with an expression that could be right on the verge of a number of emotions. The hair looks good, the necklace looks good, and the corset looks fantastic. The details in it are really, really nice and extremely detailed. 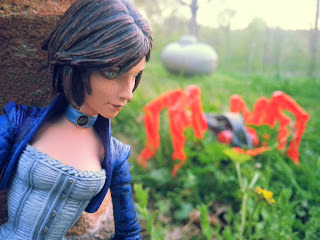 Underneath Elizabeth's skirt, NECA sculpted a nice set of bloomers and some really cute boots. Oh, and want to talk about attention to detail on NECA's part? Check out Elizabeth's right hand, most specifically the pinkie finger. Yup, it's missing. Play the game to find out why! Notice the missing pinkie? Good attention to detail, NECA. The paintwork manages to take the excellent sculpt and accent it perfectly. Elizabeth's face features some really gorgeous details that aren't really even noticeable until you're looking at her in hand or in a picture that's larger than the actual figure. Notice the freckles, subtle lip colors, and the different colors used in her eyes. Also, check out the little detail on Elizabeth's choker. It's really neat and clean, especially for being so small. While everything else is solid, it's mostly by the numbers. The corset does have a nice wash to it, though, which helps to bring out the details. The best thing I can say about this figure' paintwork is that when a figure's paint job looks just as good in a larger photo as it does in hand, that's mighty fine work indeed. I mentioned above that Elizabeth has no accessories. That's probably my only strike against this figure. NECA excels at making cool accessories, so it's a shame that they couldn't figure out something for Elizabeth to hold, or even some element that was just a cool item from the game. Perhaps it is due to the cost of the dress? I mentioned above that Elizabeth actually has a cloth dress, something that isn't typically seen on figures in the 6-7 inch scale and often has mixed results in regards to execution. I'm happy to say that this isn't the case with Elizabeth's dress. It looks perfect. It's just the tiniest bit shiny, very much like velvet. Heck, it might be velvet (I review toys, not sewing materials) as it has a bit of "stretch" to it. 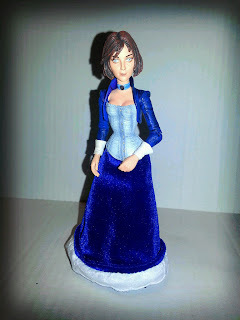 NECA certainly made the right choice here, as Elizabeth's dress is extremely eye catching. She'll make all of your other female action figures jealous, believe me. Elizabeth is a girl in a blue dress. Having has no gun, swords, or knives and being fully clothed, she's definitely an atypical female action, and yet she still manages to be excellent and exciting.  Perhaps it's the excellent head sculpt? She comes across as just a bit mysterious, but also resilient and resourceful. 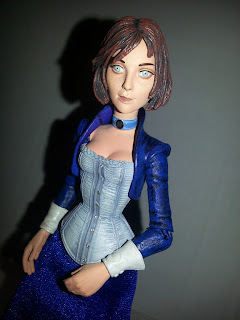 I can't say much about her character because I haven't played Bioshock Infinite, but I can say that NECA has released an extremely solid figure. While I wish she came with some accessory, there's no denying that her paint, sculpt, and articulation are all well done. I'm now more anxious than ever to play the game and learn who Elizabeth is. For those of you who have played the game and now want to know if this figure is a worthy addition to your video game figures shelf, the answer is yes. I'm rating her a great and a 1/2. Barbecue17 has 1000/1000 achievements in the original Bioshock for the X-Box 360. Go leave a mean comment on one of the pictures on his Flickr account because he's a braggart. she looks like she's looking blankly and lifeless at everthing, her eyes need a dark riming and and a more crystal blue inside her eyes. The eyeliner on her bottom lid should fade half-way at the waterline, it looks like her eyes are being closed in and makes her look sleep deprived. Her lips are much more pinker than a vampy kind of colour, this drains out her very delicate facial features and kind makes her look older than normal. Her eyebrows are a bit too thick, she has very straight-angled eyebrows that are square at start then end in a sharp point. Her hands need to have a bit more body blushing and show off that cut-off pinkie. And a bit more blush and contour on her cheeks. she looks very dead. I'll agree with the necklace needing a bit more detail, especially considering the somewhat significant role it plays in the game. I'm kind of wondering if NECA based some of Elizabeth's details and facial features off of earlier art since Elizabeth does look slightly different in the game then she did in some of the marketing materials. It's kind of like how NECA has released the Boys of Silence based on the characters original concept as ever present guards that got nixed before the game was released.